Mehndi is a significant part of all the customs and traditions of India. It is believed that the Indian wedding is not complete without the Mehndi ceremony, which is celebrated amidst much fanfare. 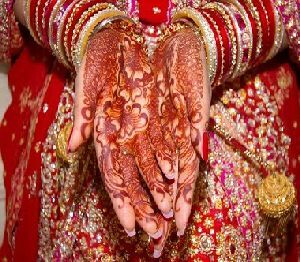 Mehndi is basically applied on the hands and feet of the bride to beautify these parts for the auspicious occasion and is usually applied a day before the wedding. Styles Of Mehndi : There are many different types and styles of Mehndi designs. The most popular types are Arabic, Indian, Pakistani and African Mehndi design. All the Mehndi designs are a lot different from each other and are famous in their own right for their uniqueness. Arabic Mehndi : This design has caught a lot of eyeballs. The color of the Arabic Mehndi is too dark and is composed of very bold patterns. This Mehndi design is less detailed and complex. Floral patterns are a trademark for the Arabic Mehndi. This design has a lot of left over spaces on the skin. Indian Mehndi : Indian Mehndi design is quite famous among people all over the world. This design is very distinguishable as it is represented with a dot or a figure on the midpoint of the palm. Finger tips are fully colored. Moreover, this design is quite detailed and covers the hands and arms entirely. Pakistani Mehndi : This design is very detailed and intricate and consumes a lot of time in its application. The Pakistan Mehndi is composed of fine fill-ins and has a very few left over spaces. African Mehndi : This design is also considered very beautiful like other designs. The African Mehndi design is composed of bold patterns representing geometrical figures, lines and dots. These are the various Mehndi designs that have caught the fancy of would-be brides. And, if your wedding date is approaching, then after reading this write-up you must have got an idea of the plethora of designs to choose from. So, adorn your hands and feet with the design that will further accentuate your beauty on your d-day and look your best. Good day I was luck to look for your theme in yahoo Your topic is brilliant I obtain a lot in your website really thank your very much..
OK good to see- informed blogs are always sweet! Blessings.